Data from our external evaluator, The Meadows Center for Preventing Educational Risk, shows pre- and post-test outcomes in each of three years of project implementation for all struggling learners across all schools on the Gates-McGinitie diagnostic. 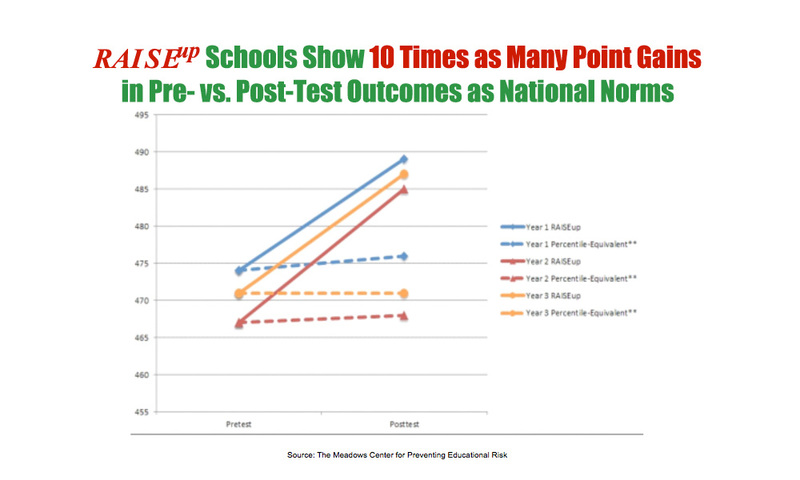 Because the Gates-McGinitie is nationally normed, we can show that struggling students in RAISEup Texas schools (solid lines) had ten times as many point gains over the year as their nationally-normed peers from across the country who started at the same level (dotted lines). The evaluators reported that these differences are very significant as compared to dozens of other efforts they have evaluated.